In red is the caudate nucleus, on top is the head and at the bottom the body. The formula indicates the method to separate the head from the body. 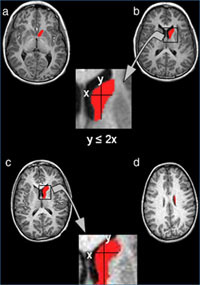 Two studies led by researchers from the neuroimaging research group at IMIM (Institut Hospital del Mar d’Investigacions Mèdiques) led by Òscar Vilarroya, and which also involved researchers from UAB and the Hospital de la Vall d’Hebron, have been cited in the “Consensus Report of the APA Work Group” as international reference works in the area of attention deficit and hyperactivity disorder (ADHD), conferring upon these researchers the status of world leaders in this field. The “Consensus Report” is a publication by the American Psychiatric Association (APA), the world’s largest psychiatry organisation and one which sets worldwide trends in the field of psychiatry. There has been significant progress in neuroimaging techniques in recent times, with such techniques now considered complementary tools in psychiatric diagnosis. To date, more progress has been made on conditions such as Alzheimer’s disease, but thanks to the work of the IMIM research group consideration is now also being given to the use of neuroimaging as a tool for diagnosing ADHD. In this regard, with this “Consensus Report,” the American Psychiatric Association has sought to review the current status of the clinical application of neuroimaging in psychiatry, specifically in disorders such as anxiety, psychotic disorders, and infantile disorders, citing the best work and research groups in the world. The first study cited by the “Consensus Report” was published in Psychiatry Research: Neuroimaging in 2008. The focus of the group’s research was on the caudate nucleus, one of the main brain structures associated with learning and memory. The caudate nucleus has three parts: the head, the body, and the tail. The research showed abnormalities in the caudate nucleus among patients with ADHD, while earlier literature described contradictory results as to what these abnormalities were. Dr Vilarroya’s group discovered that in patients with ADHD, there were abnormalities between the head and the body of the caudate nucleus, abnormalities that were not found in control subjects. With the development of a new method of segmenting the caudate nucleus between the head and the body, it was shown that patients with ADHD had a smaller right caudate nucleus, basically due to a reduction in the size of the body (and not the head) of the caudate nucleus. The second article cited by the APA, which published in Psychiatry Research: Neuroimaging in 2010, used these results to assess the possibility of classifying patients with ADHD according to the differences between the head and the body of their caudate nucleus. The analysis contained in this article showed that the result had a specificity of 95% and a sensitivity of 60%, which indicated that it could be very useful in confirming the diagnosis of ADHD. This opened up the path to using this discovery as a neuroimaging biomarker and facilitating a robust, early diagnosis of this disorder. Subsequent studies have sought to automatise the method for segmenting the caudate nucleus between the head and the body to allow a rapid and efficient use for clinical purposes. In this regard, two works have been published: one in the magazine Biomedical Engineering Online (2011), in which researchers have developed a automatised method for segmenting the caudate nucleus, based on an analysis of medical imaging and automatic learning techniques; and the other in the magazine Computerized Medical Imaging and Graphics (2012), in which researchers have optimised this method to separate the head from the body of the caudate nucleus, obtaining results that are very similar to those obtained in manual segmentation. 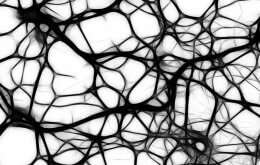 With these new methods, the main brain structures can be characterised more rapidly and accurately and an analysis and early diagnosis given of ADHD. According to experts, a reliable diagnosis of ADHD is difficult due to the fact that one must incorporate information from various different sources (parents, school, teachers, etc). Therefore, under these circumstances, access to an auxiliary test that is reliable and highly accurate is of great help in diagnosing childhood ADHD and will help provide a deeper understanding of the causes and development of this disorder. ADHD is one of the more common childhood psychiatric disorders, characterised by inattention, impulsiveness, and hyperactivity and affecting between 5% and 10% of children, and 4.4% of adults.